> I have now declared myself the unofficial poster girl for an artificial fragrance free world. I knew it was the last straw yesterday when I came home from a TV commercial shoot location with the worst headache and sinusitis triggered by an overdose of multi-scented minutia. There were candles and automatic room sprays doing their thing in an enclosed setting. I could feel the telltale signs of a severe eczema attack also cropping up as I was applying makeup to the talent extras in my chair who were obviously wearing cologne or scented body lotions. Granted this not a typical mainstream work situation, but my body was being been severely beaten down with odors that seemed to emanate from every direction in the home we shooting in. Towards the end of the day I had to have my assistant makeup artist take over completely because I became too sick from the heavily scented air in the environment to stay focused with my eyes and hands. Needless to say I was extremely grateful I had her with me, and that we could finish the job in a professional manner. From my point of view artificial fragrance is a major pollutant in the workplace that is miserably tolerated, especially with fragrance sensitive persons like me. Studies and statistics show that nearly 20 percent of the population is chemically sensitive and artificial odor reactive, so this isn’t a freak of nature condition. In fact, exposure can trigger more serious medical conditions, such as full blown asthma, or other types of respiratory and immunological attacks. I am beginning to realize that people in general don’t really understand how serious this problem is, or how dangerous it can be to the chemically sensitive who are exposed continuously to artificially odorized environments. Artificial fragr ance is added to about every liquid, semi-solid and solid, and powder based medium we use in our daily lives. People are naturally drawn to fragrance because of it’s abilities to effect positive changes their moods and productivity, and retail companies know that it also increases spending patterns such as impulse buying. 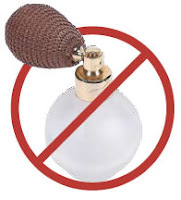 Just ask anyone who works in a fragrance based business or walk into a major department store during the holidays. You almost can’t avoid the fragrance models who fill the air with the samples they spray and hand out. Shopping at these stores pose a major health risk to odor sensitive individuals, and with a heightened flu season epidemic it can just about do a body in. I realize that fragrance is an essential component of our cosmetics world. Many cosmetic ingredients must have fragrance “masking” in order to make the chemical mixture odor tolerable as we put it on our bodies. Among the most offensive in odor are many of the natural or organically derived product ingredients that must undergo a synthesizing process, which includes odor masking. Without added fragrance they wouldn’t be marketable, and therefore bearable to apply to the skin. It is a fact that several types of auto immune diseases (both systemic and topical) are on the rise, and I am wondering out loud if artificial fragrance is a major contributing factor. I battle an ongoing a skin disorder (eczema) in which an eruption can be directly triggered by fragrance and can last for days or weeks. 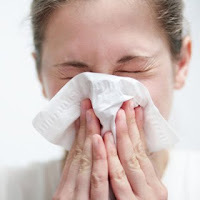 These outbreaks are not only painful but expensive, and because of the very strong prescription ointments I have to use to help promote the healing. Not to mention that these medications, over time and use, will chemically thin the skin mantle permanently and cause premature aging. Not exactly the kind of side effect I want at my age, as I need all the anti-aging help I can get! Because of the growing seriousness of this problem in the workplace there is much research that has been done, and activism that underscores the importance of fragrance sensitivity awareness. Standard operating procedures are being applied in municipal and government job markets to help educate and reduce the exposure to high risk individuals. The good news is that many employers and employees willingly make changes when they are told about the ill effects of fragrances on their colleagues. There is a lot of research, guidelines, workplace protocols, and white paper discussions on the internet concerning fragrance allergies in the workplace. WebMD, a very well respected medical resource on the web, has a good article: Fragrance Allergies: A Sensory Assault. 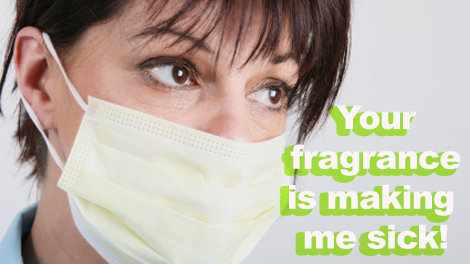 Another article is from the Human Resources Management Guide website: Fragrance Sensitivity. I encourage you to do your own investigation by using this search engine phrase “fragrance allergies in the workplace”. So what does this have to do with makeup artistry you say? Plenty. The environment you work in has a lot to do with how well you can perform your job, and this includes avoiding health hazards that pose a high risk to your well-being. As such, I don’t allow artists assisting with me to wear fragrance on the job. When I routinely check with principal talent about their sk in condition before they arrive on set I also ask them to refrain from wearing scented products. It is an accepted practice not to smoke on set, especially in the makeup room, so I see not wearing fragrance as becoming an extended part of that courtesy. Finding good fragrance free products that perform well has become almost a second career in research, trial and error. Next time I will share some of my findings, and thoughts on how fragrance free balances with the cultural move towards a more eco friendly environment.